I hope you had a lovely weekend. 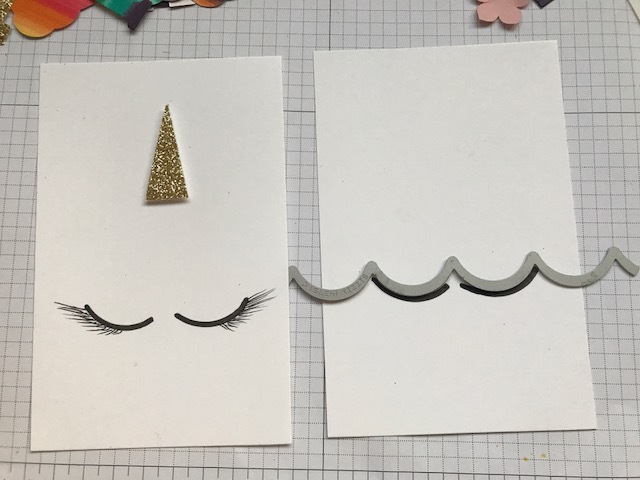 Part of mine was spent crafting some delightful Unicorn Party invitations for hubby's granddaughter who will be celebrating her 11th Birthday soon. Faye like many girls right now, is Unicorn obsessed and her invites had to clearly communicate that. Aren't they magical? She just about died when she saw them LOL. They were incredibly easy to design but quite labour intensive because of the many components .. Thank Goodness we didn't have to make a load of them. 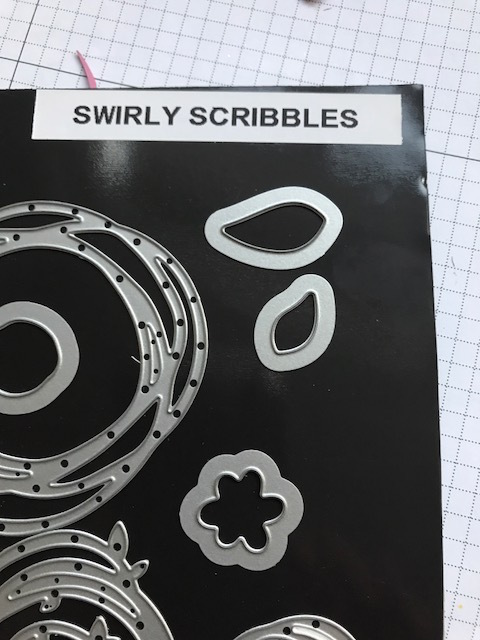 I used a thinlit die (sneak peak alert, this is from a new set soon to be released *wink*) to draw my eyes on a piece of Whisper White card stock but some punched circles of card would work just as well. 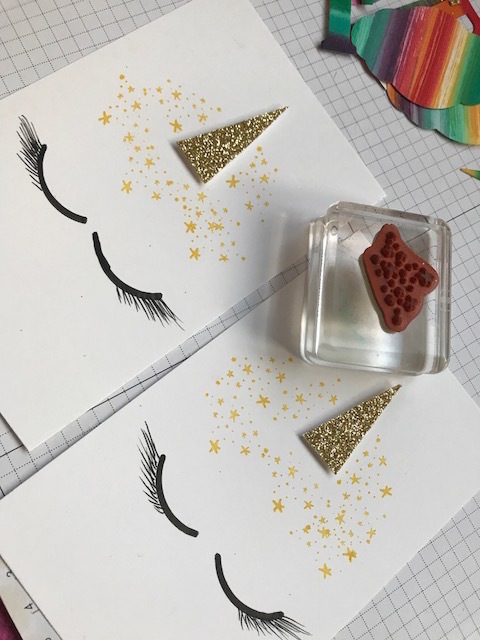 I then stamped a cloud of magical stars around the head of the unicorn using the Love Sparkles set, you can get yours HERE . And lastly I filled the space with punched out flowers. Oh the ears... I forgot to show you what I have used for the ears. Here's a view of the inside, the invitation stamp is a retired one we used to carry a few years back. I cannot tell you how many times I have used this stamp already, so glad I bought it at the time. If you have something on your wish list, BUY IT NOW before it retirees forever. 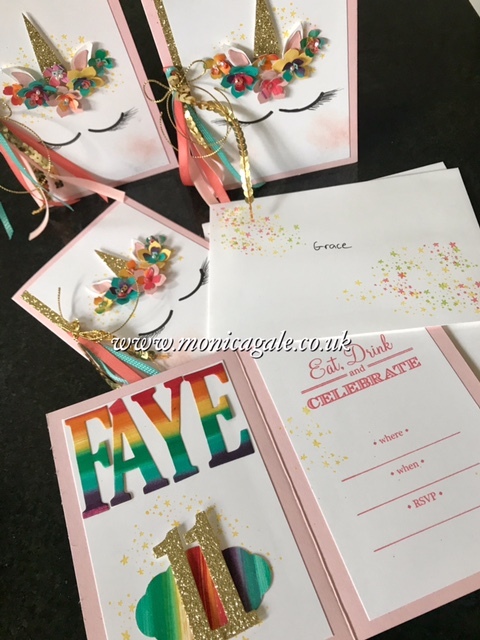 You might want to know how I made the rainbow letters?? I have used small drops of reinkers from our Brights Collection, dotted on a piece of folded baby wipe. Then I simply dragged the baby wipe over some white card and my magical rainbows appeared effortlessly. 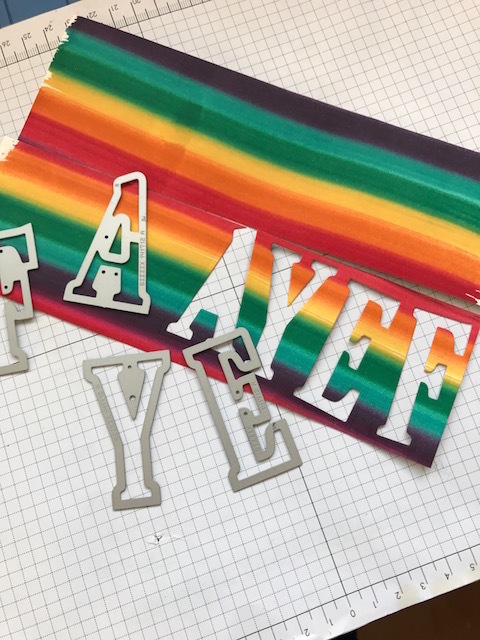 Once the ink dried, I chopped it into small sections then cut out Faye's name using our fabulous Large Letters Dies. 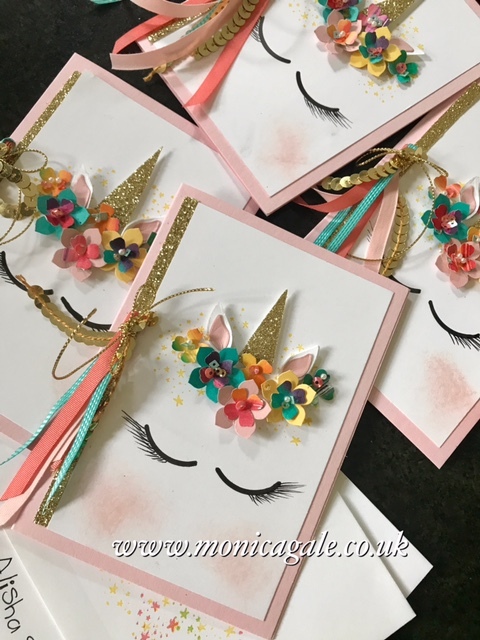 Now these babies carry an eye popping investment price tag, HOWEVER I cannot tell you how fab they are and how much you will use them if you were to buy them HERE. Also I need to tell you that you have until the end of this month to take advantage of the 10% discount for the STAMPS and Matching DIES bundle. What do you think of them? Magical right? Every little Unicorn mad Princess would be delighted with these, not to mention the lucky recipients that receive one of these. How generous of you to share all those lovely tips and tricks! 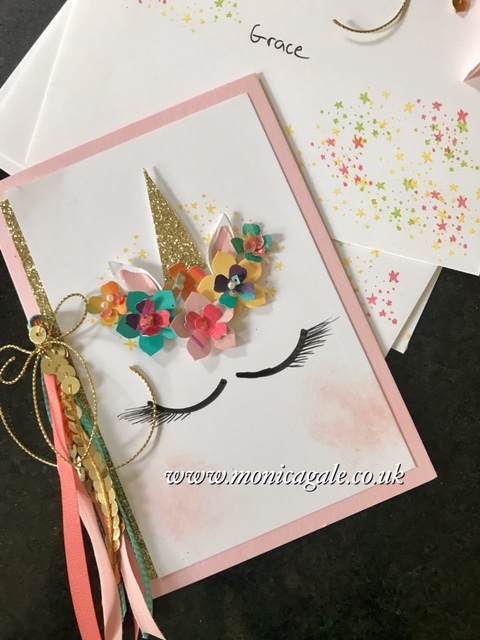 I think your monicorn is fabulous, you did an amazing job even down to the sparkly detail of ribbons and sequins and yumminess! Oh how gorgeous your invitations are. I am sure you will all have a fabulous party. This is adorable! I would loved to have seen your rainbow colored fingers after the baby wipe technique. wow these are amazing, I bet all her friends were envious.